Lymphatic filariasis is an infectious parasitic disease caused by microscopic, thread-like roundworms. These parasites are transmitted to humans through the bite of an infected mosquito. They then develop into adult worms in the ‘lymphatic vessels’ of the body, causing severe damage and swelling. Symptoms result primarily from inflammatory reactions to the adult worms. The adult worms only live in the human lymphatic systems – this network of lymph vessels maintains the body’s fluid balance and facilitates the body’s ability to fight infections. Filariasis can be effectively treated with drugs. However, when the infection is chronic (long-standing) the condition may not be simply cured by anti-filarial drugs but require other measures such as surgery, expert care of the skin and/or exercise routines to increase lymphatic drainage. Large scale prevention involves annual treatment of all individuals at risk in endemic areas with a recommended anti-filarial drug combination, or the regular use of specially fortified salt. In Africa, the most common mosquito vector is the Anopheles, the same species that transmits malaria. In the Americas, it is the Culex species – that also transmits Japanese Encephalitis and West Nile virus. In Asia and the Pacific, filariasis is transmitted by the Aedes, also renowned for transmission of Zika virus and Yellow Fever, and also the Mansonia – a vector for Rift Valley fever. Repeated mosquito bites over several months to years are needed to get lymphatic filariasis. People living for a long time in tropical or sub-tropical areas where the disease is common are at the greatest risk of infection. Short-term tourists have a very low risk, but this may not be the case for expats, living abroad for several years. When a mosquito bites a person who has lymphatic filariasis, microscopic worms circulating in the person’s blood enter and infect the mosquito. This infected mosquito can then bite another person and the microscopic worms pass through the skin, and travel to the lymph vessels. In the lymph vessels they grow into adult worms. An adult worm lives for about 5–7 years. These mature worms mate, releasing millions of microscopic worms, called “microfilariae”, into the blood. This cycle then perpetuates the spread of the parasites, following further bites, producing more infected mosquitoes. There are three different filarial species that can cause lymphatic filariasis in humans but over 90% of the infections worldwide are caused by “Wuchereria bancrofti”. Most infected people are asymptomatic and will never develop clinical symptoms, despite the fact that the parasite damages the lymph system. A small percentage of infected people will develop ‘lymphoedema’. This is caused by the parasites producing an inflammatory reaction which results in the leaking and improper draining of the lymph system. The fluid that subsequently collects produces swelling that mostly affects the legs, but can also occur in the arms, breasts, and genitalia. If people develop these symptoms, they often occur years after being infected. In younger children, the infection usually presents with non-specific symptoms of fever, headache and muscle aches, mimicking many tropical infections. In teenage children, it is more likely to present with scrotal pain and swelling. The swelling and the decreased function of the lymph system make it difficult for the body to fight infections. Affected persons are therefore more susceptible to bacterial infections in the skin and lymph system. Many of these bacterial infections can be prevented with appropriate skin hygiene. Men can develop a ‘hydrocoele’, or swelling of the scrotum due to infection with the parasite W. bancrofti. This develops in around one third of males with chronic infections. 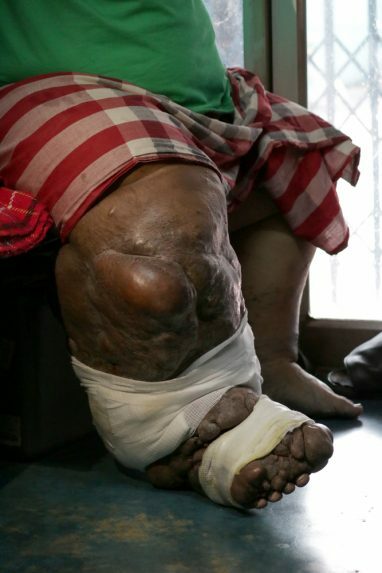 The most spectacular symptom of lymphatic filariasis is “elephantiasis”— often gross oedema with thickening of the skin and underlying tissues. Elephantiasis results when the parasites lodge in the lymphatic system. Interestingly, this was the first disease discovered to be transmitted by mosquito bites. Elephantiasis affects mainly the lower extremities, while the ears, mucous membranes, and amputation stumps are affected less frequently. Filarial infection can also cause tropical “pulmonary eosinophilia” syndrome (TPE). This syndrome is typically found in infected persons in Asia, and commonly affects men between the ages of 20 and 40 years. Clinical manifestations of TPE syndrome include cough, shortness of breath, and wheezing. The standard method for diagnosing active infection is by identification of microfilariae by microscopic examination of a blood smear, from a finger prick test. The finger prick test draws blood from the capillaries of the finger tip. In most parts of the world, microfilariae are nocturnally periodic, which means that they only circulate in the blood at night. For this reason, the blood collection has to be done at night to coincide with the appearance of the microfilariae. In 2003, the common antibiotic doxycycline was suggested for treating elephantiasis. Filarial parasites have symbiotic bacteria in the genus Wolbachia, which live inside the worm and seem to play a major role in both its reproduction and the development of the disease. The antibiotic doxycycline would act against the Wolbachia, thereby disrupting the reproduction of the parasites. Clinical trials in June 2005 by the Liverpool School of Tropical Medicine reported an eight-week course almost completely eliminated microfilaraemia. A somewhat more reliable diagnostic blood test was recently developed that may be used at any time during the day. This test is based on the detection of antibodies generated in response to the infecting organisms, the parasites themselves. People infected with adult worms can take a yearly dose of medicine, called diethylcarbamazine (DEC) that kills the microscopic worms circulating in the blood. Progressively increasing doses of any one of the major anti-parasitic drugs is the treatment for the disorder. Among these drugs are: ivermectin, albendazole, and DEC. These drugs work to get rid of the larval worm, to inhibit reproduction of the adult worm, or to kill the adult worm. These drugs are effective but they do have substantial side effects that may require the use of antihistamines and/or anti-inflammatory drugs. While this drug does not kill all of the adult worms, it does prevent infected people from giving the disease to someone else. Lymphoedema and elephantiasis are not indications for DEC treatment because most people with lymphoedema are not actively infected with the filarial parasite. Elevate and exercise the swollen arm or leg to move the fluid and improve the lymph flow. Disinfect any wounds. Use antibacterial or antifungal cream if necessary. Use DEET mosquito repellent on exposed skin between when outside..
Programs to eliminate lymphatic filariasis are under way in more than 50 countries. These programs are both reducing transmission of the filarial parasites and decrease the risk of infection for people living in or visiting these communities. Another approach to prevention includes giving entire communities medicine that kills the microscopic worms. Annual mass treatment reduces the level of microfilariae in the blood and thus diminishes transmission of infection. This is the basis of the global campaign to eliminate lymphatic filariasis. As a result of the humanitarian contributions of these drugs by the pharmaceutical companies, tens of millions of people are being treated each year. Since these drugs also reduce levels of infection with intestinal worms, benefits of treatment extend beyond lymphatic filariasis. Successful campaigns to eliminate lymphatic filariasis have taken place in China and other countries. Lymphatic Filariasis is transmitted via mosquitoes and is caused by parasitic worms. It results in a damaged lymphatic system and the abnormal enlargement of body parts, causing pain and severe disability as well as infections. 73 tropical and sub-tropical countries are affected: 950 million individuals at risk; 120 million people infected; and 40 million patients incapacitated and disfigured by the disease. In order to stop the spread of infection, single annual doses of two anti-parasitic medications are given. A basic recommended package of care can alleviate suffering and prevent further disability among lymphatic filariasis patients. When lymphatic filariasis becomes chronic, it leads to tissue swelling, or elephantiasis, of limbs and the swelling of breasts and genital organs. These body deformities lead to social stigma, as well as financial hardship from loss of income and increased medical expenses. The socioeconomic burdens of isolation and poverty are immense.